Shep investigates the latest trend of customer service “gamification”. A growing trend that I’ve been writing about recently is “gamification,” defined by Wikipedia as “the use of game-thinking and game mechanics in non-game contexts in order to engage users.” Companies are using games to enhance the customer experience and engage with their customers, as well as their employees. It is a winning strategy for businesses – providing customers with entertainment in a fun, competitive way builds the company’s image and level of interaction with its customers. Some of these games are in the form of downloadable apps, taking advantage of the popularity of games for mobile devices such as smartphones and tablets. One of my favorite examples of gamification is the online arcade at the Home Shopping Network’s website (www.hsn.com) that attracts tens of thousands of users each day. Badgeville offers games that motivate and inspire employees to reach a higher level of performance. Games are a great way for businesses to increase customer interaction and provide a better working experience for employees. 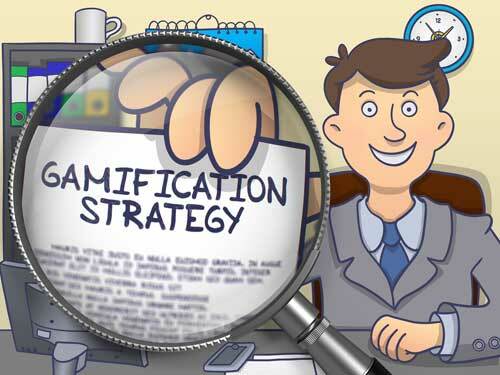 Gamification is not just for large corporations. Chris Ressa of DLC Management, a commercial real estate management company based in New York, manages a fantasy football league for his customers. This unique plan for engaging customers through a game is interesting on many levels. 1. The fantasy football league does more than connect Chris with his customers; it encourages them to interact with each other. It offers a sense of community. People tend to enjoy the company of others, especially if there is a common interest. The game offers a shared interest and connects those who participate. As they check in regularly to follow their players and teams, they are forming a bond, and Chris is the connecting factor. 2. The game expands and strengthens the business relationship to something more. Chris can keep in touch with his clients on a regular basis without having to talk about business. It is personal and fun, and it moves the focus from deal-making to building a friendly relationship. But, when the time comes to focus on business, where do you think they will turn? 3. Ongoing contact makes it easier to attain customer loyalty, which in Chris’s business, means lease renewals. Loyalty is not generally gained by one single transaction with a company – it starts with the first interaction, but has to grow from there. Contact between the business dealings makes Chris’s job easier. He doesn’t have to check in a month or two before a lease expires, he already has established a method of ongoing, frequent contact. 4. Chris is having fun, too. If you can add fun to your work, why wouldn’t you? You – and your customers – will be happier, and your business will benefit. As you can see from the way Chris applied the concept, you can personalize the way you connect with your customers through games or other fun activities. There are countless ways – online and offline – to create a better experience for customers and employees through fun interaction. Shep Hyken is the Chief Amazement Officer of Shepard Presentations. As a professional speaker and best-selling author, Shep helps companies develop loyal relationships with their customers and employees. How Does Singapore Airlines Fly So High?